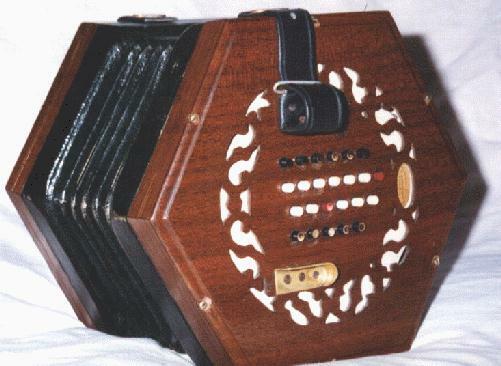 This concertina, made by Wheatstone & Co in 1895, has the standard 48 buttons of an English concertina, but plays a straight octave lower than the treble. In addition it has brass reeds, which at this pitch give it an extraordinarily sweet tone. Note the bone buttons. These are coloured white for notes in the key of C and black for accidentals, with the C notes themselves coloured red. These are sometimes described as tutor buttons and the assumption made that concertinas fitted with them are therefore cheaper "tutor" models. This is in fact wrong, as Wheatstones coloured all their bone buttons in this way, and it was a matter of personal preference by the customer whether to have metal, bone or glass buttons.